This post and giveaway is sponsored by Snyder's of Hanover. All opinions are my own. For years, I have admittedly bypassed the Snyder's of Hanover Pretzels on the shelves. 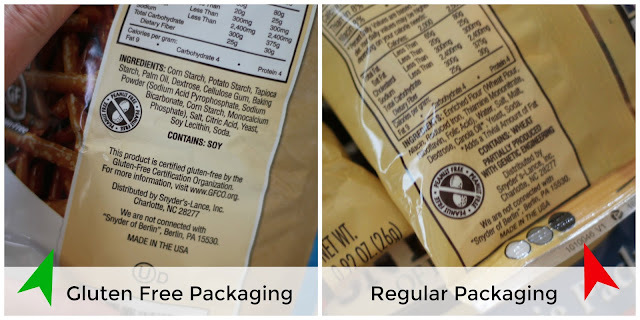 Even when they released their Gluten Free Pretzels (which are now certified GF), I knew looming on the backside was that warning... "Made in a facility that handles peanut butter." While I appreciated their labeling, since it's not mandatory to label for cross-contamination, it was something my family could not eat. WELL, THAT HAS CHANGED! Snyder's of Hanover production at its main pretzel bakery in Hanover, Pennsylvania is now dedicated Peanut Free. To celebrate the change, we're giving away a #PretzelsBaby Prize Pack + a $25 Visa Gift Card to one lucky winner! Per the company press release: "Snyder's of Hanover pretzels made in any of the company's peanut-free facilities will have packaging clearly marked with a peanut-free icon and allergen information. Many of the products, including favorites such as Pretzel Minis, Pretzel Sticks, Pretzel Snaps and Pretzel Rods already display the new allergen information and are on shelves now. Remaining products with updated graphics will be on store shelves by the end of the year." Side Note: The gluten free pretzels are also free from dairy and egg. 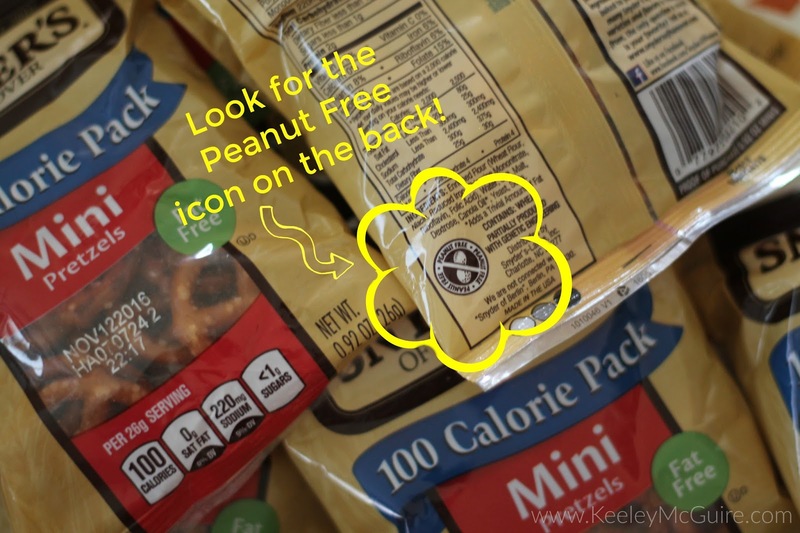 The pretzels are actually tree nut free, as well, but the labeling change is specific to peanuts to assure consumers that the pretzels are now made in the free-from facility. Snyder's of Hanover is still producing their Peanut Butter Filled Pieces but those are being manufactured in a separate facility in Canonsburg, Pennsylvania. Little Miss was super excited to get to try their gluten free pretzels finally, since they no longer carry a peanut warning. 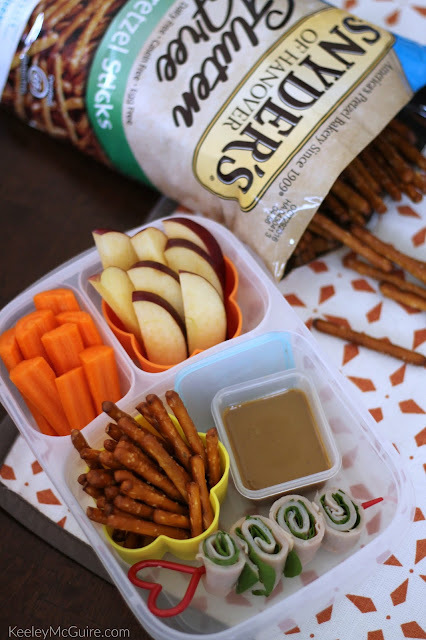 Now, we can pack them up for snacks and even lunch! Although, one of her favorite ways to enjoy pretzels is dipped in allergy-free chocolate. 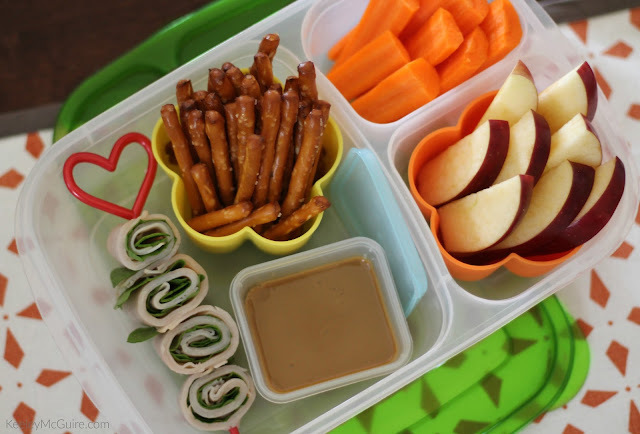 gluten free pretzels, apples, and carrots in it for lunch. Thank you Snyder's of Hanover for taking food allergies seriously and giving families another great food choice for back-to-school! 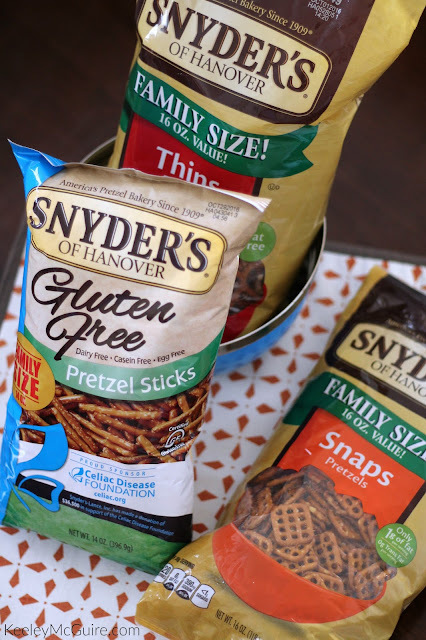 Snyder's of Hanover is letting us give away a #PretzelsBaby Prize Pack + a $25 Visa Gift Card to One Lucky Winner! That is so awesome. :) My family would love these for back to school. I'm excited to try their gluten free options for my son. Then we can all have pretzels without him feeling left out. So exciting!! Are these going to be available in Canada? So Happy Synders made this change! I'm excited to find out more! That's so great of them to much such an effort! I want to try the Pretzel Snaps. I cannot wait to find the snaps and mini pretzels!! My son is allergic to nuts so this will be perfect for him, especially since he starts preschool next month and I have to provide his school with snacks. The snaps will be perfect to make candies with....I'm so excited!! The snaps pretzels look good. I would like to try the snaps #PretzelsBaby. I really want to try the Snaps Pretzels. I am most interested in trying the three cheese pretzel poppers. I'd like to try the snaps pretzels! I would love to try the gluten free pretzel sticks. I would love to try the pretzel sticks. I would like the pretzel sticks. I am excited for the gluten free pretzel sticks. I am happy to see that the gluten free pretzels are now also peanut free - yeah! Awesome news! We would love to try the Gluten free twists. The Gluten-Free Hot Buffalo Wing Sticks sound so good! The Dark Chocolate Mini Dips sound awesome. I'd like to try those. I've been eating these for a while now. Nice to see your Little Miss can have them now!! I tend to prefer the twists over the sticks. My son has a severe peanut allergy and loves pretzels! He would love the snaps. After the recent recall with pretzels, it is wonderful to hear another company committing to peanut free. I would like to try the gluten free pretzel sticks. #PretzelsBaby I would enjoy trying the White Creme Mini Dips pretzels. The SNAPS is what I want to try. My favorite are the Snaps! The pretzel snaps are one of my favorites! Thanks for the giveaway! I want to try the sticks! #PretzelsBab This is big for my family since my little grandson has a peanut allergy. Oh they all look so good! I will say the Gluten-Free Hot Buffalo Wing Sticks! I would like to try the Gluten Free pretzels. I have some digestive issues. Would love to try the Snaps! The pretzel snaps sound amazing.. I want them! I would love to try the snap pretzels fist. They sound so good. I would really like to try the Gluten Free pretzel sticks! My little one has egg/milk/pn/tn allergies. I want to try the Snaps!! I'd like to try the pretzel sticks. They are the perfect snack. Still giving away bags, we would love to try them!